Following their appointment earlier this year of a Principal Conductor better known as a pianist, Lars Vogt, the Royal Northern Sinfonia now complete their artistic team with a Principal Guest Conductor better known as a violinist, Julian Rachlin. Rachlin made his conducting debut with the Sinfonia in October 2013 and has since led the Israel Philharmonic, Czech Philharmonic and the Academy of St Martin in the Fields. Rachlin will be appearing as conductor and soloist with the Sinfonia in a concert at Milton Court in London tomorrow evening (November 14). The programme comprises of Schnittke's Sonata No 1 for violin and chamber orchestra, Mozart's Violin Concerto No 5 and Beethoven's Symphony No 7. Rachlin was just 14 years old when he appeared as a soloist with the Vienna Philharmonic, still the youngest soloist to have appeared with that orchestra. Andrew Achenbach interviewed Rachlin for Gramophone in 1995 when the violinist was just 19 but already had two recordings for Sony Classical under his belt. At that time Rachlin said, 'When I'm playing, I really want to tell the people something, to move something within them, and I believe that the public will always respond to any artist who is genuinely trying to convey some sort of emotional message. After all, why should we be ashamed of expressing our innermost feelings?' 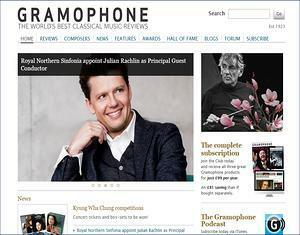 It looks as if the Royal Northern Sinfonia have some exciting concert seasons ahead.